Dish's Network Custom Integration program has been enhanced to include paying integrators a set monthly revenue-share fee. 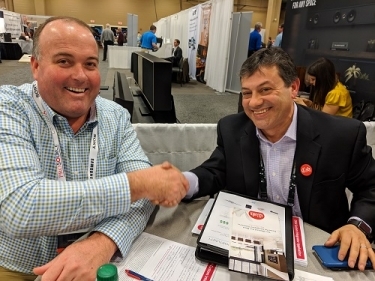 At the recent ProSource Summit, Frank Defilippis (right) of Dish signs on Jason Pair of Pair Electronics in Greenville, N.C. to the Dish Custom Integration Program, which now includes a recurring monthly revenue share for dealers. Dish Network is upping its game even higher in the custom integration space with the announcement of a new recurring monthly revenue (RMR) incentive program per qualifying account as part of the Dish Custom Integration Program. Launched in September 2016, the Dish Custom Integration Program gives integrators the ability to easily create accounts for clients, provides access to skilled technicians for on-site surveys and complex installs, and includes a dedicated support hotline managed by an award-winning VIP concierge team. “We continue to improve our Custom Integration Program, which includes outstanding white-glove service and support, and now an incentive for purchased accounts,” says Amir Ahmed, Dish senior vice president of sales. "With the addition of the new revenue sharing program, we’ve found a meaningful way to reward the custom integrators." The new RMR benefit is additive to the existing margins available to custom integrators. Effective immediately, the new incentive will be applied to purchased accounts through the Dish Custom Integration Program. Qualifying accounts must have at least three Dish set-top boxes, including the Hopper 3, and America’s Top 200 programming package or above. Accounts also must remain active to receive the RMR payout. “With the introduction of Hopper 3, Dish created a new standard in premier video delivery,” says Ahmed. In other Dish Custom Integration news, the organization recently joined the custom electronics buying group ProSource as a Vendor.